Our Power Pricing System, Advertising Solutions to Get the Phone Ringing, Employee Recruitment Programs, Coaching to Keep You on Track, and More! 22% PROFIT IN 120 DAYS! 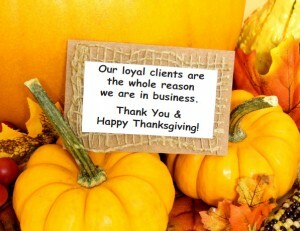 Each Thanksgiving, our family-owned marketing company finds that we have more and more to be thankful for. So before this family stuffs the bird and sets the table, we’d like to take this opportunity to give thanks. 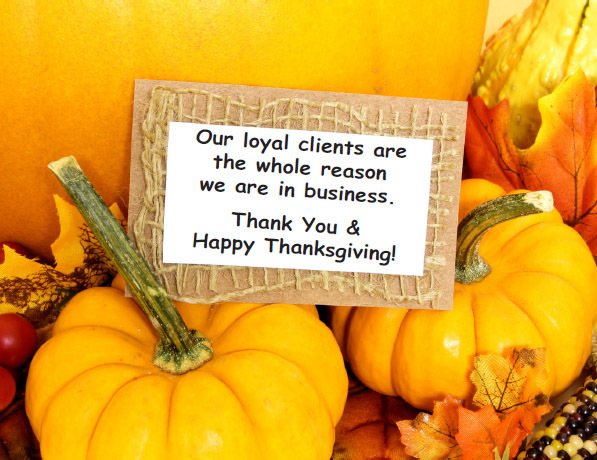 First and foremost, we’re thankful for our many clients strewn all across the United States and Canada. Without our loyal clients, we wouldn’t have become the successful, trusted, prosperous marketing company that we are today. Our clients give us the opportunity to do what we do best—implement effective marketing solutions. We’re additionally thankful that our field lends us the chance to help so many businesses flourish. Our clients already have the knowledge and skills to perform their trades expertly, and our marketing campaigns simply help customers that are in need of their services find them. We know that our marketing services help our clients meet their goals, and for that we are grateful. When our clients’ businesses grow, prosper, and succeed, we in turn grow, prosper, and succeed. Most importantly, we thank God for the continued blessings of health, wealth, friends, family, work, ministry, grace and favor upon our family and company. Thank you to all of our past and present clients who have chosen Contractor 20/20! We appreciate your patronage, referrals, and testimonials, and we look forward to serving your marketing needs in the coming year. We will continue to grow, to learn about the latest in advertising strategies, and to provide the best marketing services available to help our clients meet and even surpass their individual goals. We hope that you find you also have a great number of things to be thankful for this holiday season. From the Contractor 20/20 family to yours: Have a Happy Thanksgiving!! !